I consider myself a pretty adventurous eater. It’s a little embarrassing that it took a work trip to Great Falls, Montana for me to discover “butter chicken.” I didn’t even know what it was. When the lunch counter worker told me this was her favorite thing on the menu, I said “dish it up” and thought I was likely getting something southern and literally smothered in butter. Instead, I get this amazing, spicy Indian curry dish that has become my new obsession. Needless to say that when I got home the search began for a recipe. I settled on using the New York Times as my inspiration. I will be making this again and again and again. Hint: This recipe makes a good sized batch and is designed for the leftovers that are phenomenal. 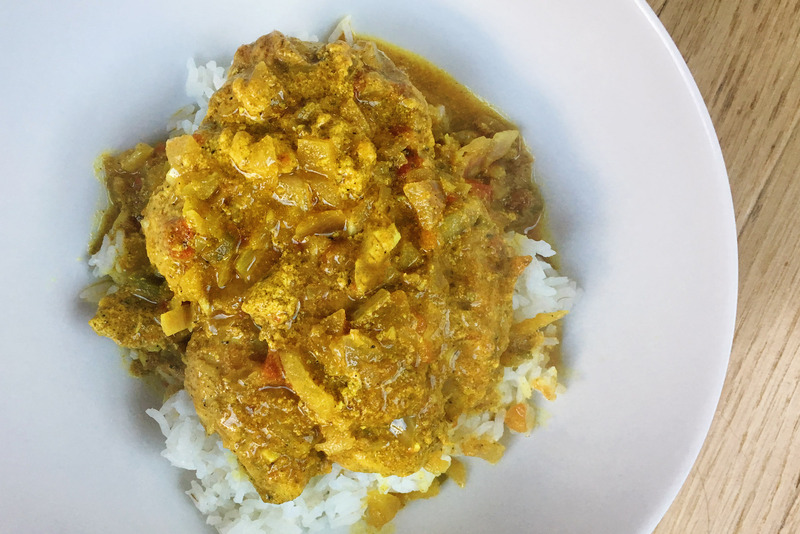 Pour whatever is left of the curry over rice and just warm in the oven the next day. The curry infused rice takes it to another level. Step 1: In a large bowl (enough for the chicken to comfortably fit), whisk together the yogurt, lemon juice, turmeric, garam masala and cumin. Coat each piece of chicken with the yogurt mix and set in bowl. Cover, and refrigerate for minimum 6 hours or maximum 1 day. Step 2: In a large deep skillet that will hold all chicken pieces without stacking them (I used my cast iron) over medium heat, melt the butter. Add chopped onions, and cook, stirring frequently for 5-7 minutes. Add the garlic, ginger and cumin, and cook another 5 minutes. Step 3: Add the cinnamon stick, tomatoes, jalapeños and salt. Add chicken chicken pieces with all yogurt sauce and cook for 5 minutes. Add chicken stock and get mixture to a boil. Lower the heat and simmer, uncovered for 40 minutes. Step 4: Stir in the almond milk and tomato paste, and simmer until the chicken is cooked through, approximately 20 minutes more. Test chicken by cutting through to make sure done, taste sauce and add salt if needed, turn off heat to let sit for 5 minutes and serve with rice. Day 2 tip: Those leftovers will be insane! We put the leftover rice in a covered casserole dish, poured the chicken and sauce over top, and stored in the refrigerator. The next day we put the whole dish in a 365 degree oven with the cover on for about 45 minutes. The flavor intensified and was incredible.